You can find Elizabeth here. All sorts of places: colors in nature and in the man-made world around me; books and magazines about all kinds of textiles; looking at yarn; looking in stitch dictionaries. Some designs seem to come to me and then I find the yarn. Sometimes, I find a yarn I like and through swatching, an idea takes shape. 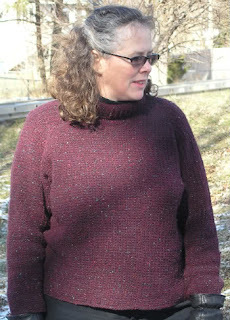 I'm amused when I read knitters complaining on forums about having to swatch. I swatch for fun. Fair Isle and other similar stranded styles. I try to be as inclusive as I can, often writing patterns for sizes S-3XL. Being plus-sized myself, I'm sensitive how limited some patterns are in their size ranges. In the 80s, when I first started designing my own sweaters, I could work with some patterns as written because they were over sized, drop-shoulder styles with about 10" of wearing ease. I wasn't particularly plus size at that time, and I was still larger than the largest intended wearer of a lot of patterns. I try to accommodate patterns to fit at least up to a 52" bust, sometimes more. 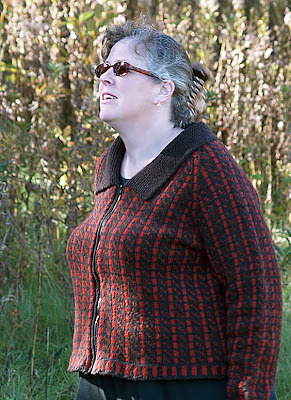 Some patterns are difficult to scale, because of the geometry of the armholes or repeats in a pattern design. 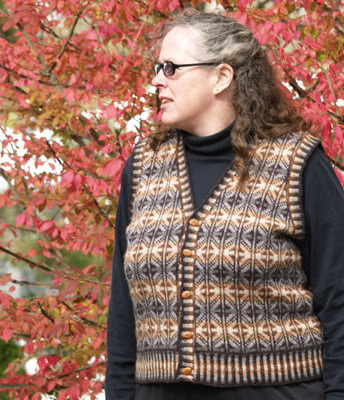 I think there are more variations in proportion among the very plus sized than among, say, size Small knitters, so that adds another challenge to scaling patterns. This means that the plus-size knitter might have to be a bit more analytical about getting a good fit, instead of being able to knit every pattern exactly as written. I try to incorporate choices like bust darts or waist shaping that the knitter can include or not, as needed, to get more space where needed. I look at other designers' work all the time. I like to see where the trends are going, even though I don't usually follow them. I love seeing amazing things that other people do with color or inventive ways of combining techniques. When I think I have an idea for a pattern I want to try to sell, I do a quick search through Ravelry to make sure there aren't already patterns that are similar. I've abandoned a few ideas that were original in my mind, but someone else had done first. It depends on what day you ask me and maybe the specifics of the pattern. The digital download means that print costs no longer need to be the same kind of constraint they were 20 years ago, so we don't need to say, "Repeat as for Right Side, reversing all shaping." As designers we can specify just what to do to get a mirror image of the right side for your left side of your cardigan. I do expect knitters to learn the basic abbreviations and techniques. I'm a book-learner who does very well following clearly drawn illustrations and charts, so it can be hard for me to remember that some people really are wired differently. They may need to be shown by a human or to read words, rather than look at pictures. I try to err on the side of over-explaining because it seems like the right thing to do. I've always done my own sample knitting, though I know this limits my productivity. Part of this is because I still do a lot of designing on the needles, rather than mapping it all out in my head and on paper first. Partly, it's my control freak side that doesn't want to turn it over to other people. Partly, I don't know that I have enough of a market to cover the added costs of paying sample knitters. 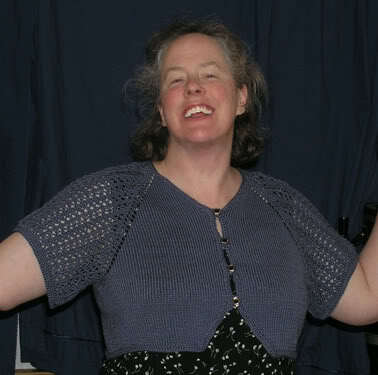 I probably wouldn't have tried to work as a knitting designer if it weren't for the Internet. 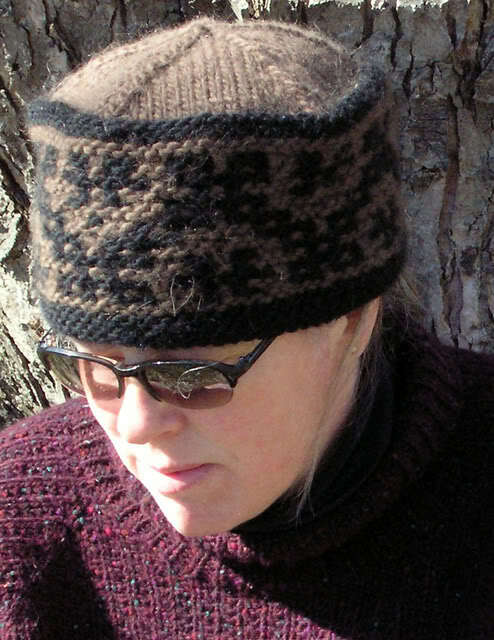 I was considering pursuing knitting design for about 15 years before I made the leap, but I was both intimidated and pretty busy with other stuff. In the early 2000s, I joined an online knitting forum and a couple of the women there had the idea to start an online shop for downloadable patterns. In 2005 we opened a site called The Garter Belt. It was a pretty new idea at that time. We were starting to build a following when the main organizer stopped communicating with us and eventually the domain name expired and that was the end of that. I thought about pursuing having hard-copy patterns printed and wholesaling to yarn shops, but it seemed like that market was shrinking, rather than expanding. Eventually, I started using Ravelry to host my pattern sales and recently I had a site built, sweaterstudio.com. This fall I hope to ratchet up my self-promotion and see where that takes me. I didn't for the first several years. A lot of the patterns I've been releasing more recently were tech edited for publication by the magazine that originally published them. Going forward, I will be using one for patterns that don't get tech edited for magazine use. In the school year, it's pretty easy. My kids are occupied for many hours, 5 days a week. Summers are a challenge and I tend to feel completely out of balance. As they are getting older now, though, I feel like I can tip the balance more toward work, even if it means travel or being a little less available to them. I've been a full-time mom for over 16 years and I'm ready to see if I have something else in me. I haven't attained the kind of widespread recognition that brings the most criticism, so haven't had to deal with a lot of it. I know that my style doesn't suit everyone. I don't generally design a lot of things that a trendy young person will love. My knitting style is usually guided more by practicality than by fashion, so I've heard a few barbs about some of my patterns not being cute enough. One of my patterns seemed to leave a good percentage of the people who made it a little confused. 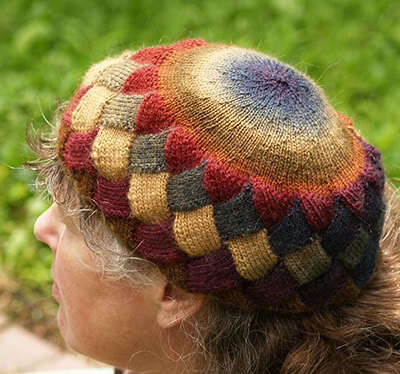 When I first read this on Ravelry, my impulse was to get defensive and blame the knitters. I had to stop, take a deep breath, and think what I could do to make the pattern more clear. The knitters appreciated this and said as much in public threads. In my personal life, I've tried to learn to listen to criticism and be willing to see the truth in it. It doesn't come easily, but it's a path to growth. I'm not supporting myself now. I think the people who do successfully build a career have a lot of drive and focus. They are able to travel for teaching engagements and events like TNNA. They are able to build a following of blog readers and their blog posts reflect care and cultivation of an image. When I've thought about the reasons I wasn't building that same recognition, I had to admit that I wasn't putting the same kind of care into it. It sounds crass, but I think a lot of the folks who've jumped from blogging to wider recognition have a keenly developed sense of marketing. And I think you need the kind of healthy ego that lets you keep trying, even if you've been rejected or ignored. Secondarily, I think learning your way around some of the support skills is a good idea. Pay for professionals when you have to, but if you can learn your way around page layout software, make your schematics in Adobe™Illustrator, build a website, or have good photography skills, all the better. I love E. Morrison patterns. I do think Elizabeth is underestimating her patterns when she says that none of her patterns are something that cute, trendy people would love. Beautiful design transcends. 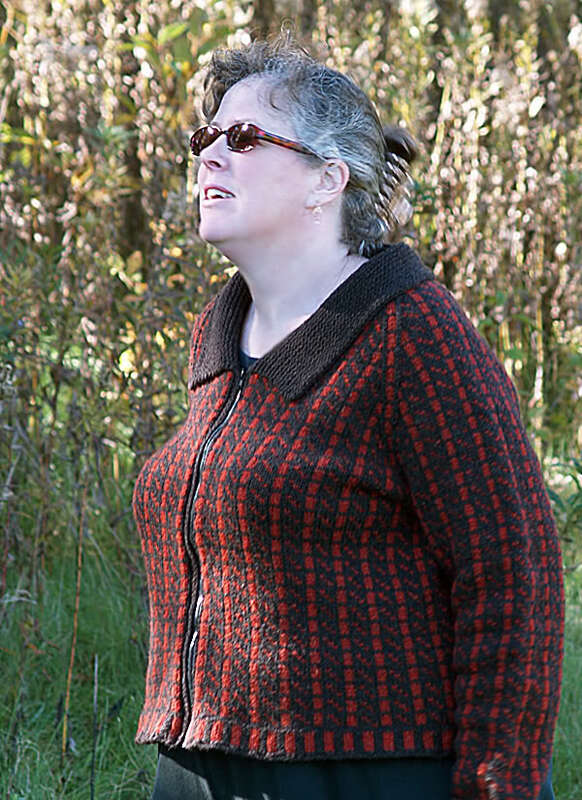 I'm thinking about the Kate Cardigan and the Sloane Pullover in particular. She also has some nice men's sweaters, hats, etc. available. One day I will make The Professor Vest. It's definitely worth your time to stop over at the sweaterstudio. Following the journey of a knitwear garment from the initial design through to production, how the retailers maintain success and what setbacks they encounter. I found your website when searching the internet for research and loved reading all of the interviews with various designers and also learning about your knitting history. I would be very grateful if you wouldn’t mind answering some questions for me? This would be a huge help with my studies. If you could email me back to this address I would be very thankful.